krv 4k? 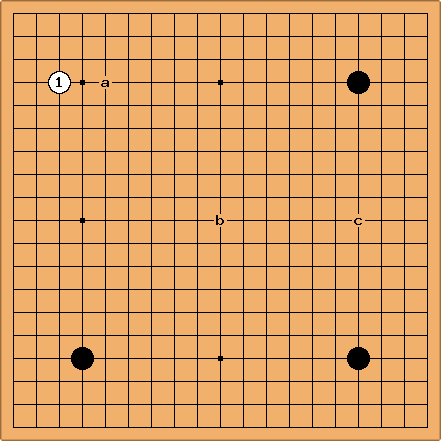 I have a question about moves value in the fuseki. Can we say that every move in the fuseki has his own value? How can we determine this value? 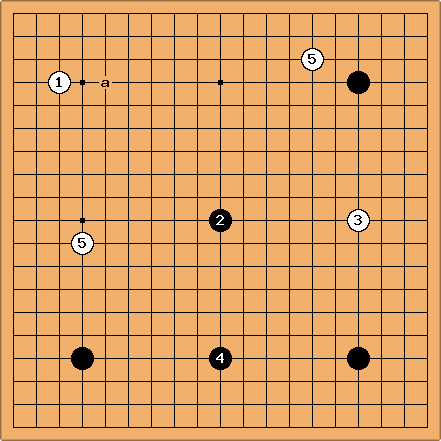 For example, what is the value of the move in the empty corner (3,3), (3,4), (4,4)? May be value is exactly 2*komi (13 points)? How is the value affected by other areas? Have anybody try to determine the value of the popular fuseki moves? I've tryed to find this in the wiki/net but haven't succeeded. Please give some ideas or links. Can we say that every move in the fuseki has his own value? Bill: By perfect play and comparison of results. Bill: That's a good guess. :-) However, first you have to know what the correct komi is. 6.5 is probably still too low, IMHO. 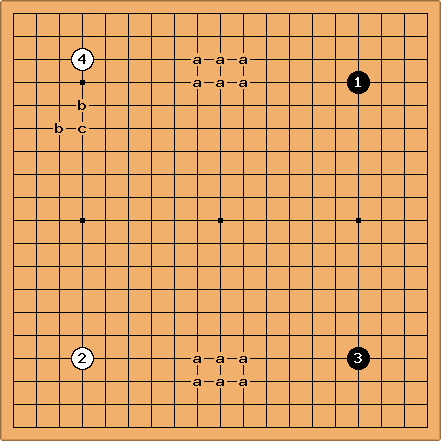 Second, because of the miai implicit in the symmetrical empty board, the initial moves could be larger and cancel out. Third, the value of 13+ points is a miai value. You could draw the wrong conclusion if you think it is a deiri value, which is what most players still assume. Bill: That is worth several books. The most important rule of thumb, I think, is Do not approach strong stones. There is a corollary: Do not threaten to approach strong stones. And a corollary to that: Do not threaten to threaten to approach strong stones. Etc., etc. Bill: Ishida Yoshio wrote a book about the value of plays at all stages of the game. Unfortunately, he used the traditional value of 10 points (miai) for early plays, which is almost surely too low. Environmental go is a way of eliciting professional opinion about the value of plays throughout the game. It could also be a good training method. Bill: The 'a's are most likely inferior to the 'b's and the lone 'c', but not by much. Fuseki books make comparisons, but not in precise numerical terms. First, it is impossible, given our ignorance of perfect play. Second, it is not necessary in many instances. And anyway, the largest play is not always the best play. I like chess master E. A. Znosko-Borovski's advice: "It is not a play, not even the best play, that you seek, but a realizable plan." Velobici: The recent (2005) book A Dictionary Of Modern Fuseki The Korean Style outlines specific patterns for more than 53 fuseki. The only moves the book describes are the 'b's. Six patterns (chapters) totaling 42 pages are devoted to continuations after the one space high approach. One pattern of 4 pages to the two space low approach. It does not give numeric values to the plays indicated. Bob McGuigan: To complicate things the value of a move depends on potential for future development. I think this applies even in the early fuseki, so, say, the 5th move's value could easily depend on the whole board position. DrStraw: It is an interesting question but, in my opinion, purely an academic one at the amateur level. The difference between, say, a 14 point move and a 13 point move is probably outweighed by the mood of the player on any given day. Until you reach the very top levels of amateur play I beleive it is impossible to make such precision meaningful. Bill: I agree with DrStraw that small differences in the fuseki do not mean much, as a rule. OTOH, if you lose 1 point per move in the first 40 moves, that adds up to a lot! And IMX, even dan players can easily drop 5 or more points in a single move in the opening. For instance, they can take gote when they should not, or they can ignore Bob's point about the potential for development. DrStraw: Sure Bill, but my point is that at the amateur level you are not going to lose 1 point per move for 40 moves. At least not if the players are close in rank. Random fluctuations in players mood is more likely to result in each losing 20 points and the total cancelling out. I often want to play tengen as black's first move in a 3-stone game. It seems the obvious move to me (12? kyu). However, I've recently observed four 3-stone games between dan players without seeing tengen. Three out of four played a in the diagram, one c.
Is there anything wrong with tengen here? unkx80: There is nothing wrong in playing the tengen here. Just that compared to corners and sides... it is far more complicated and harder to grasp. Therefore I do not advise playing the tengen for a 12 kyu. There is extensive discussion at why don't we open at tengen. PurpleHaze: I would not play tengen here for the same reason I think is an error. Black has an enormous lead in influence, not in territory. Black should not play tengen because he has no need of influence. White should not play the 3-4 point because it is strongly biased towards territory, and she needs influence far more than territory. Pashley I recently observed many IGS 3-stone games, all with White 2-dan or above. 1 was much the commonest white move, about 9 out of 12. After , either of seems to restrict Black's development. How much would one estimate the value of a typical "double wing" to be? Say 4-4 plus two side star points? What is the value of playing the second "wing"? What is the value of denying it? I think this question can't be answered without having information about the rest of the board. For example, the 3-3 invasion is there and if the opponent is strong on the adjacent corners then the outside influence resulting from the 3-3 invasion might not be as effective as you would want.